My Life As A Chronically Ill Young Adult : Throw Back Thursday! A growing trend on Facebook, Twitter and Blogs is something called Throw Back Thursday. This trend involves posting pictures from your past and writing about them. So I decided to jump on this bandwagon and post a picture of my favorite stuffed animal. Frosty is his name and he has been with me since I was in pre-school. My teacher Mrs. Worthen, gave him to me when I was in her class around Christmas time and from that moment on he went with me every where. Every trip my family would go on, he would be there. Every doctor appointment and stay in the hospital, Frosty was by my side and helped comfort me through it all. Sadly though in eighth grade I went to the hospital for some asthma problems and Frosty got lost in that hospital. At the time I had a young roommate whom we believe may have been in foster care. My mom and I would sit with her and do her hair for her and spend time talking with her. The only options of where Frosty could have gone was in the dirty linen bag when the staff remade my bed that day before I left or that little girl. I like to think that my roommate took Frosty because she saw how much I adored him and loved him and wanted something like him. If she has him, I hope he has brought her as much peace and comfort as he has brought me. When we got home, I was devastated. I cried and cried for days. 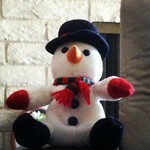 My two older sisters and my mom spent days upon days searching for the same snowman stuffed animal that I used to have. The maker of the stuffed animal no longer made him, since it was so long ago. So hen my mom found one, she bought it and then she found one that was in even better condition she bought that as well. One of the ladies she bought it from asked my mom why she was interested in Frosty and my mom shared with the women my story and how I had lost him. This kind women sent me my new Frosty all the way from Canada for free. No it is not the same as the original, but he will always be in my heart and the kindness of two women who have given me Frosty twice now will always be something I appreciate and cherish.